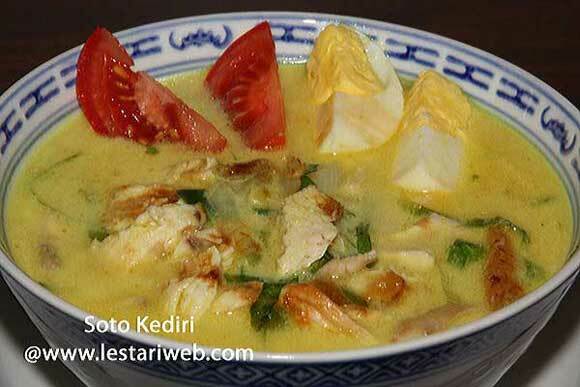 There are many different varieties of Indonesian beef or chicken spiced soup, includes a "Chicken Soup ala Kediri". For you info Kediri is a small town in East Java Province, a place where I was born ;-). So I have been familiar with this dish since my childhood times. 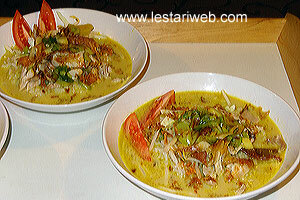 Compare to another spiced soup, this one is quite different. It is not clear as others because it contains coconut milk. But this difference which make it special and unique! 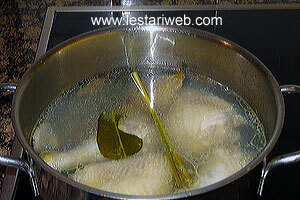 Put the chicken breast, lemon grass, salam / bay leaves, galangale and ginger and 1 tsp Salt in a deep saucepan. 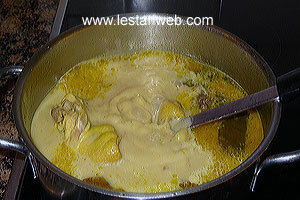 Pour in 1 liter water, cover the pan and cook the chicken on a medium heat until half cooked. Put all ingredients for the spice paste in a blender or food processor & blend until smooth. (If necessery add a little bit oil to help the blending process). 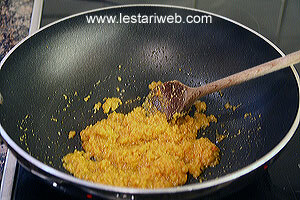 Heat 2 tbsp oil in a frying pan, stir-fry the paste all the time until fragrant. (Don't add oil if already added in a blender during the blending process). 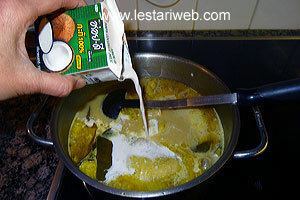 Transfer the paste to the deep saucepan and add the coconut milk to the deep saucepan. Bring over medium heat to boil. Stir occationally to prevent the coconut milk from separating..
Take the chicken out, set aside to drain or pat dry with kitchen paper. 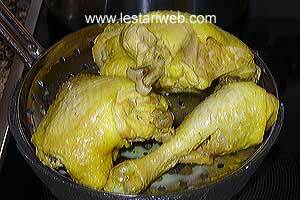 Heat 50 ml oil in a frying pan or deep fryer and fry the chicken until golden brown. If preferred, you can also deep-fry the chicken in a Friteuse/deep fryer. Let it until cool enough to handle then slice or shred the fried chicken into small strips. Preparation : Arrange all the items and condiment in a serving plates. The soup should be kept pipping hot. 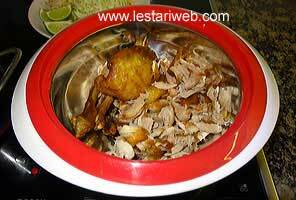 Serving Method: Put the sliced chicken in a individual bowl or a dish. 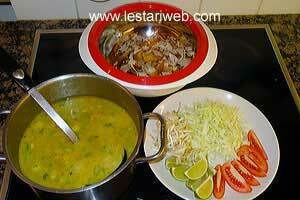 Garnish with cabbage/lettuce, tomato and egg then pour in the hot soup. Press a lemon slice over the soup. Last but not least pour a little bit kecap manis on top. Serve hot with rice. Thanks a lot for visiting my site. Have a fun while cooking and enjoy your meal!